We continued to have reliability problems: failure of the projector advance circuitry, and failure of the triac power control circuitry. Somehow, pulses were going through these control elements and frying the driving circuitry. Using our trusty oscilloscope, we saw massive several hundred volt spikes coming from the final stage power control elements, and everything we put in the circuit to try to control them would get fried. We even called GE to ask about these damaging signals. GE said it was not possible. Right. It’s just gremlins blowing up our circuitry… Well, after a number of different circuits were tried and tested, we finally found one (using optical coupling) that could not cause that problem, and the resulting reliability was greatly enhanced. Likewise, we finally found the right combination of protection circuits, including a pulse transformer, to get the power control circuit to be reliable. This entire process - of establishing the electronic means for total reliability in the electronics for slide projector control - took several years. Of course we could not really address the reliability of the projector itself, but actually, they were pretty reliable. Digital electronics was rapidly growing, and the complexity of available chips - which stated with SSI (Small-Scale Integration) quickly advanced to MSI (Medium Scale) and LSI (Large Scale). In addition, single-chip microprocessors were available (around 1974), but were still too expensive for us to consider ($300 or more for a single CPU chip). We set out to define a digital system that would give us a proper "light curve" or "power curve" for fades, so that the cross-fade, or dissolve, would stay at the same brightness during a dissolve, merely changing the image. Not much we could do about the slight color shift, however, due to the color temperature of the projection lamps. We had accomplished this with a network of resistors and zener diodes in the analog domain, to convert a linear ramp into a curve that gave the desired result. In the digital domain, we needed to have a variable rate clock - one that would go at different speeds at different points in the AC power cycle, to give the desired results. Having finally perfecting this, with a small handful of SSI and MSI parts, we decided to transmit this signal from the "programmer" unit out to all the dissolve units, thus reducing the number of IC’s (integrated circuits) in the dissolve units. This worked, well, but did require that all dissolves be connected to the same power circuit as the programmer, since the AC power "sync" was in the programmer. We released this system in similar cabinets, painted silver. It was initially named the Imagician Diamond System, and we manufactured a much larger number of these units for sale to other organizations. Our primary competitor was AVL Labs, based in New Jersey. Their strength was marketing. They always had the lion’s share of the market due to their abilities in that area, even though our products were significantly superior. We always checked each other out at trade shows. When demonstrating our new Imagician System on the trade show floor, one of the engineers from AVL showed up, and offered to "show me his" if I "showed him ours." OK, I said. So, I gave a demonstration. We had a programmer, a memory unit, and dissolve units. He made the assumption that - if you have a memory unit, you must, by definition, have a microprocessor inside. On the way to their booth, he put his arm around my shoulder, and asked in my ear "so what microprocessor are you using?" Actually, we were not using a microprocessor yet (AVL was). I had designed the memory unit with a good number of SSI and MSI chips. Yup. Insert. Delete. Append. Clear. Run. Pause. Sync to Music. The whole works. All implemented with a "custom" microprocessor of my own design. Actually, it is unfair to call it a microprocessor, as it did not execute software, but had its instructions hardwired. I told the AVL engineer "we use nano processors" - thinking of the counter chips that sequenced the hardware instructions as a "nano processor." He was certain I was lying, and refused to show me anything at the AVL booth. I got a big kick out of that! They did not think what I had done was "possible." And, were intimidated! Ha ha! By little ol’ me! Kodak announced a new camera format - 110 - and new "mini" or "pocket" projectors to go with the new, tiny slide format. We took these tiny projectors, a tape deck, an audio amplifier, a hi-fi speaker, and a diamond dissolve and put it all into a small custom-built suitcase, along with a portable projection screen. We called this product the Pocket Diamond. It greatly simplified doing a product presentation, or any other type of presentation, as the only thing you had to do was take off the top, set up the screen, plug it in, and aim and focus the projectors. Press Play, and off you went! It was a very popular product, unique in every respect. One issue we had was hum being picked up from the projector fan motor, which was so close to the tape head. We tried many things, and did succeed in suppressing the hum sufficiently so it did not cause problems. The large magnet speaker and open cabinet area under the projectors gave the sound quite a lot of bass, so hum removal was a big issue. Careful routing of signal wires and shielding helped a lot. Microprocessors! Finally! Affordable at Last! We had been watching the development of the microprocessor families for some time. When MOS Technology broke the price barrier with the 6502, offering it at $25 each (yes, Apple, Commodore, and many others were born on that day), we were quite excited. It forced all the other companies to do likewise. Our favorite processor - because of an amazing and powerful instruction set, was one from Phillips. If I remember correctly, it was the 1802, or something like that. However, they made a little mistake. There was a single addressing mode they had forgotten to include. Once this was discovered in the industry, they were dead. When they fixed it 6 months later, it was too late. Then Mostek started advertising the $10 single chip computer. WOW! This really got my attention! An entire COMPUTER on a single, 40-pin chip! With 2K ROM, 64 bytes RAM, 4 8-bit I/O ports, a serial port, and a few other goodies. For $10, if you masked 1000 parts with the same program! I was sold on this idea: unbelievable price, and amazing function! I bought the development boards and a TI silent 700 tape-drive terminal for programming, and started developing what later became the Star3 System, then the Micro Diamond and Micro Star Systems, and later the Star Sentry Series. 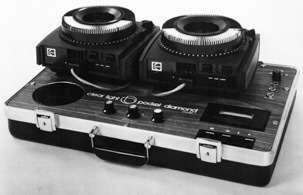 The Star3 System was introduced in 1978. The "chip" that started the personal computer revolution! A mere $25 would buy you one piece! This system enabled the incredible Starlight Fantasy show. You can read about it and hear the soundtrack on our Clear Light Media page. The Star3 System used 4 different program masks for the 3870 single-chip computer: one was the programmer , which allowed the user to create a program or play one back. The second chip was the encoder/decoder, which encoded or decoded digital signals on the tape recorder from which the system could play back a programmed show. The third chip was the dissolve chip: it totally controlled the 3 slide projectors advance/reverse mechanism, sensed when the projector was completed in a advance/reverse cycle, and controlled the power to the 3 projector lamps. The lamps even had "soft start" which - when turned on from being off, or doing a "cut" would always take 50 milliseconds to apply power, rather than suddenly doing so. This made the projector lamps lifetime expand 5 to 10 times longer, as the inrush of high current into a cold (and low resistance) lamp was the usual cause for a lamp to &apos;blow" - usually right at the start of a show! The fourth chip was the memory programmer chip. That was the first memory programmer that could run at 100 cues per second, and could "sync" to the music, simply by pressing the "cue" switch when you wanted the next event to happen. We called this "SyncroLink." The system would memorize the time, you would not have to bother with the actual numbers of milliseconds..! Other systems on the market required you to use a stopwatch and enter manually all the timing for your show. This was a breakthrough, as were many other of our inventions. At that point in time, Clear Light did not have the funds or sense to file patents. For $4,000, we had 4000 chips made, with these 4 programs. We had, naturally, to rerun the first 2 programs, since they were used the most. This made our units unbelievably inexpensive to build, as our 4 chips required very few external parts, especially in the dissolve units. Historically, we had targeted a 10X price from components cost. Our competitors were at 3X. This is how, in spite of our inability to market, we stayed in business. Our prices were as good as or lower than our competitors, and our profit margins much higher. A great story must be told: after I left Clear Light for Apple, AVL approached the new owner of the company to purchase the Micro Diamond system. They asked for a Bill of Materials (BOM). When they received it, they called and said they were not interested, because clearly they were being lied to. There was NO WAY a dissolve unit could be built with such few parts! I love that story! You can see a photo of the MicroDiamond System on my Clear Light Photos page. We ended up with a few more programs: one for the Micro Diamond Memory Programmer, which also was used in the Micro Diamond Dissolve. One for the Micro Star Memory Programmer, and one for the Universal Interface, which could encode and decode up to 50 cues per second on tape, along with an "automatic resend" signal which would force a projector back to its correct position if something happened. Below is one of our final dissolve units, the Star Sentry Series Dissolve 3. This unit has Data Sentry, the same ability as the Universal Interface, but at only 20 cues per second rather than 50. Another favorite story came from another trade show interaction. This was when we were first introducing the Star3 System, in January of 1978. We still had not received the masked ROM parts for the memory programmer, so we were running it from an emulator board, which was housed in a box under the table, along with its power supply. The CEO of Spindler and Sauppe, another of our competitors, came to see a demo. He had heard that we were claiming to be able to operate the projectors as fast as they would go, and not lose the location even if power was lost. He did not believe that, so wanted a demo. We gave him the demo, and he asked "how do you do that?" And I said "by sensing the projector. We know when it is finished doing its advance or reverse cycle."